A Spider's Kiss cocktail has all of the gruesome details you want for a haunting party. 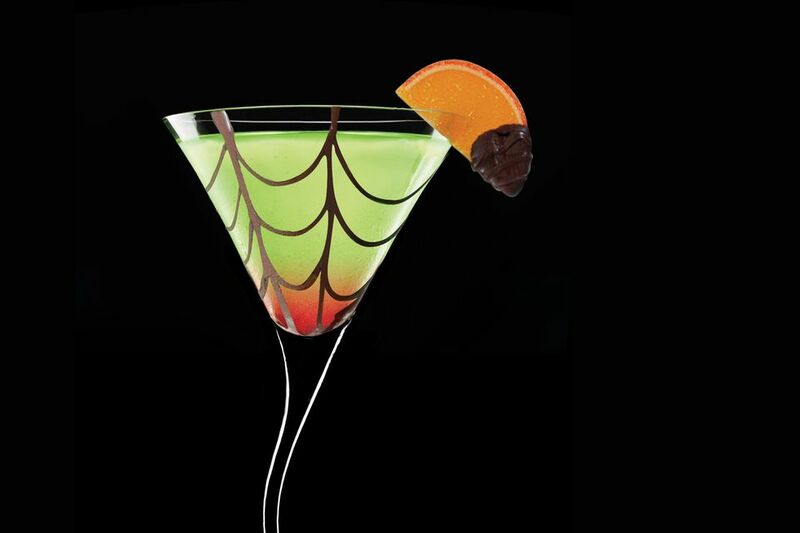 The visual effect combines chocolate spider webs dripping with "blood" (actually, grenadine) surrounding the unmistakable green glow of Midori. It's quite the sight, just be sure to chill the glass after the applying the webbing for the ultimate ghoulish cocktail. Draw a chocolate web onto a cocktail glass. Place in freezer and chill for a ghostly effect. Add the Midori, vodka, and lemon juice to a cocktail shaker with ice. For a blood effect, drizzle grenadine down the side of the glass. Garnish with a chocolate-dipped orange slice. The webbing can be tricky. To get a nice, clean effect with the chocolate syrup you will need to have a syrup that is not too runny and you will want to put the glass into the freezer immediately to stop any flow on the inside of the glass. Also, the webs will begin to disappear once the glass begins to warm, so it is a look that will not last long, though it is fun. If you want the absolutely clean, sharp look like that in the photo, draw webbing with markers on the outside of your glass. There are a few glass markers available at craft stores and some wash off while others will not. For this reason, it may be best to use older or cheaper glasses and save your good glasses for the next party.